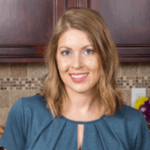 Published: May 17, 2016 · Modified: Apr 12, 2019 · By Jen Sobjack · This post may contain affiliate links. 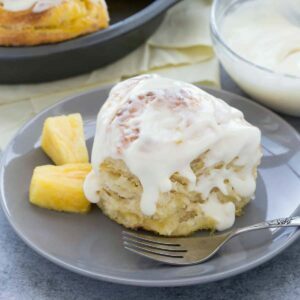 No knead pineapple sweet rolls are just the thing you need to brighten your morning. These fluffy sweet rolls are filled with homemade pineapple curd and topped with a cream cheese icing. There’s absolutely no kneading involved with this simple yeast roll! I have an amazing treat for you today and it involves the pineapple curd I shared last week! This recipe is the reason pineapple curd exists. Bright, tropical flavor that is perfect for incorporating into a spring breakfast. These sweet rolls are so incredible. The dough is soft and fluffy. 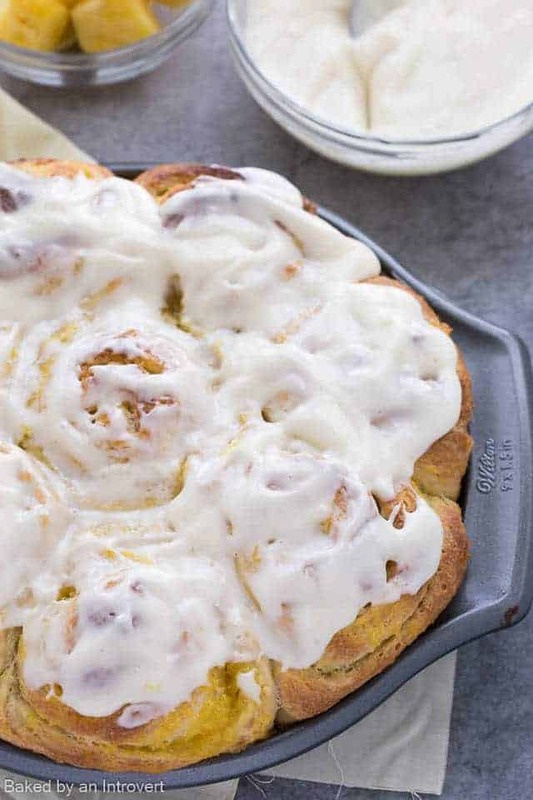 It’s a no-knead sweet roll recipe so you don’t have to do a lot of work. But the flavor and texture is spot on. Perfection. The dough does take a bit of time to prepare, so plan ahead. It is made much like this rosemary olive beer bread. It has to sit overnight in order for the gluten to develop, thus allowing us to skip the kneading. Filling the rolls with sweet pineapple curd gives them so much flavor. It is best to make the curd a day ahead. This will give it plenty of time to cool down and thicken. It’s easier to work with that way. Add even more flavor, by topping the curd with crushed pineapple before rolling the dough. This isn’t necessary but it is highly recommended. Bake the rolls and serve them warm with cream cheese icing. You will absolutely love them! The yeast dough is no-knead making this recipe incredibly easy. Each roll is light, fluffy, and full of aromatic yeasty goodness. The curd can be made a day ahead for convenience. No-knead pineapple sweet rolls are just the thing you need to brighten your morning. These fluffy sweet rolls are filled with homemade pineapple curd and topped with a cream cheese icing. There’s absolutely no kneading involved with this simple yeast roll! Add the flour, sugar, salt, and yeast to a large bowl. Stir with a whisk to combine. In a 2 cup measuring cup, add the butter, egg yolk, vanilla, and milk. Stir with a whisk to combine. Add the milk mixture to the flour mixture. Stir with a wooden spoon or silicone spatula until moist and soft dough forms. Cover the bowl with plastic wrap and let sit on the countertop for overnight, 12 to 24 hours. Spray a 9-inch round pan with nonstick spray; set aside. Turn the dough out onto a lightly floured surface. With well-floured hands, flatten the dough slightly then fold it over onto itself to form a small square. Roll the dough out into an 8×14-inch rectangle. Spread 1/3 cup pineapple curd over the dough, leaving a 1-inch border around the edges. Spread the crushed pineapple evenly over the curd. Roll the dough up starting on the long side. Pinch to seal the seam. Cut into 8 rolls. Arrange the rolls cut side down in the prepared pan. Cover and let rise for 1 hour or until doubled in size. Preheat the oven to 350ºF. Bake for 30 to 35 minutes, until lightly golden brown. Spread icing over warm rolls and serve immediately. Beat the cream cheese and sugar until smooth. Add milk and vanilla. Continue to beat until well blended and smooth. Yumm! I love pineapples! Never would’ve thought to use it in sweet rolls. Thanks for sharing! Love the pineapple filling! I wish I had one of these rolls to go with my coffee! No kneading and all that pineapple goodness? This is getting pinned and made – my pineapple-loving husband is going to be SO happy! Yay! Thank you for pinning! Enjoy!! 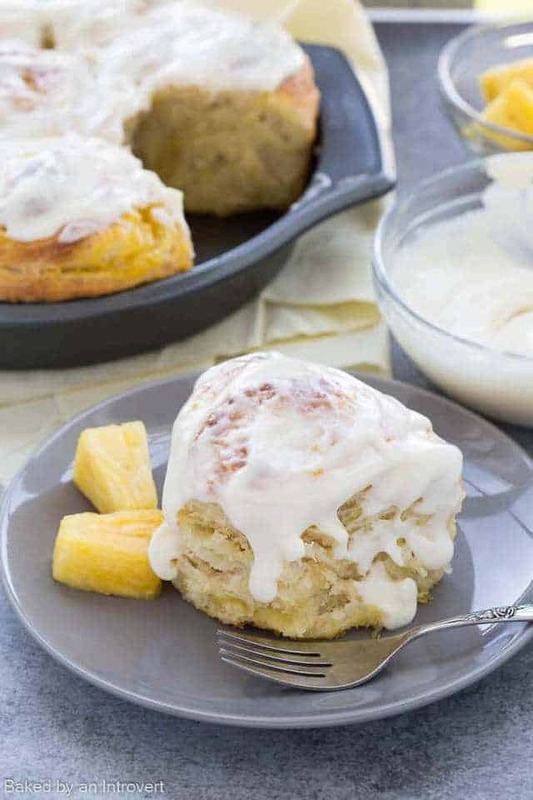 I love that you used your homemade pineapple curd in these sweet rolls. These look absolutely divine! Can I just eat one right now?! I haven’t made sweet rolls in a while! These look amazing! Love he pineapple curd and the icing! Pinning! Oh wow these look so fluffy and I’m sure the pineapple curd is just to die for in these! Oh. My. Drooling! WHY are we not neighbors?! I swear, the smells coming from your house on a daily basis must be incredible! And you KNOW that I love the fact that these are no-knead! 🙂 I’ll take any shortcut I can get! You had me at pineapple curd, but then you threw in cream cheese frosting! Gah! these pineapple sweet rolls and the homemade pineapple curd . . uh, yummmmm!!! love these, Jen! I’ve been looking for an excuse to try your pineapple curd and I definitely think I just found it! 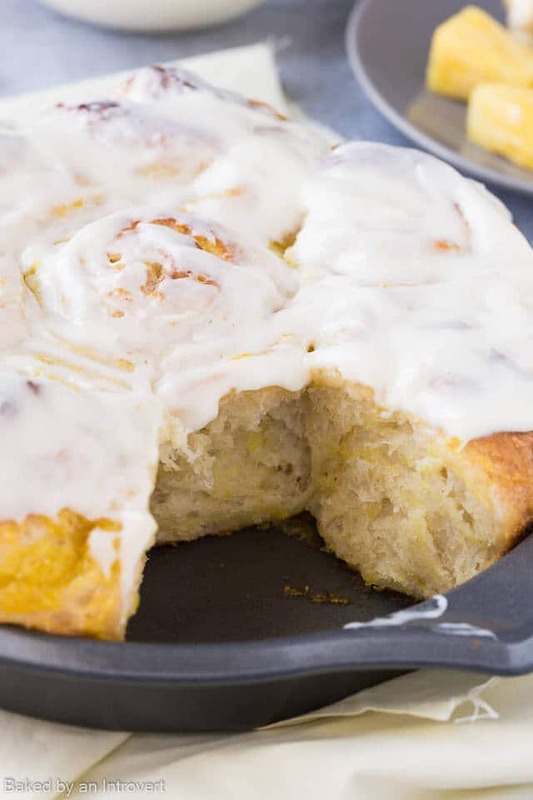 Holy MOLY Jen, these sweet rolls look absolutely incredible! They look SO so soft and fluffy! This is the perfect recipe to use your pineapple curd in, Jen! I’ve never had any kind of roll with pineapple before, so I’m loving this sweet treat. Especially that cream cheese frosting…looks SO good!